This article was originally published on gofitu.com on August 27, 2016. There’s a difference between dedication and obsession. What kind of diet I was planning to go on at 8 years old, I don’t know but from that point on, I struggled with my weight. Throughout middle and high school I tried every diet out there…Weight Watchers, Jenny Craig, Special K Diet, etc etc. The summer going into my sophomore year of college, I started working with a personal trainer in the bodybuilding industry. I lost 30 something pounds. I finally had become the person I wanted to become – I finally had the body I wanted to have my whole life. During the first few months of working with my coach, I slowly started to develop obsessive behaviors towards eating and exercise I slowly started to develop behaviors and attitudes that were crucial in helping me reach my goals. And while I was getting the results I wanted, I didn’t see the subsequent effects these physical results were having on me mentally. I didn’t realize how obsessive I had become because to me, I was just dedicated to the plan. I was still my happy-go-lucky self, I just had the drive and willpower to get done what I needed to get done. It took almost a year for me to see and accept my obsessiveness and start to work myself out of it – and let me tell you, it was not an easy process. It took time, practice, some more time, and some more practice to get me to where I am today, living a moderate and balanced healthy lifestyle. Below is an account of an average day during my sophomore year (4 years ago), the peak of my obsessive fitness behaviors. It may read a bit dramatic but everything written is something that I once thought, felt, or experienced. To some, this may read as a day in the life of someone who’s just very dedicated to fitness. And that’s true. Dedication does come with a bit of obsession. But there’s a point in time when your obsession becomes greater than your dedication, and it’s at that point when you can get hurt. 7AM – Wake up, immediately bring hands to stomach to feel how flat it is. Do I have abs yet? 7:05 – Get out of bed, go stand in front of a mirror, lift up shirt. Do I have abs yet? 7:07 – Head to the scale, start to feel the tension rise in your chest. Step on the scale, hold your breathe, wait for the little magic numbers to appear below your feet. If the number’s higher than yesterday, your body floods with devastation. If the number’s lower than yesterday, endorphins rush through you. 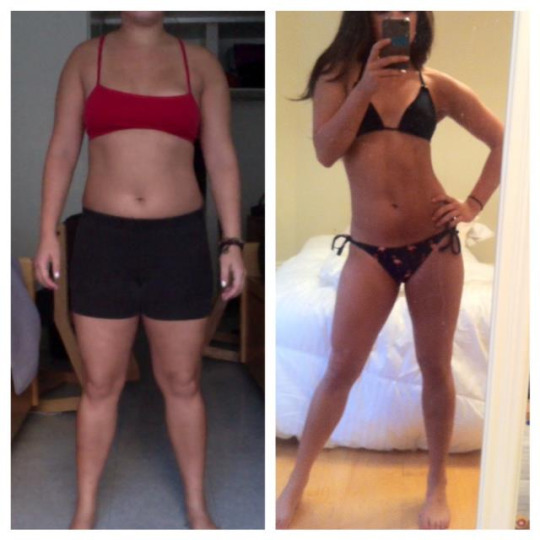 7:10 on Saturday - Have your roommate take progress photos so you can send them to your coach. Do I have abs yet, coach? 7:30 – Grab your lunchbox filled with meals for the day (which you obviously meal prepped last night) and head out the door for gym session #1: cardio. 7:45 – 45 minutes of HIIT, because coach says that burns the most fat. 9AM – Meal 1: 5 egg whites, 1/3 cup oats and depending on the day, 1/2 a grapefruit. Enjoy with a cup of coffee and handful of supplements coach told you you need. 9:30 – First class of the day. Walk into class with your giant lunchbox, liter water bottle and gym bag. These items are just as essential as – if not more than – your backpack and textbooks. 9:30 on Saturday - Begin checking email frantically to see if coach emailed you back yet. 12PM – Second class of the day, where you enjoy meal 2: 3 oz chicken, greens, 1 tbsp of olive oil. Start thinking about meal 3 immediately upon completion of meal 2. 2:30PM – Gym session #2: weights. Like any good workout plan, you know exactly what you’re working that day. Coach has you training legs Monday & Friday, back on Tuesdays, shoulders on Thursdays, chest/bi’s/tri’s on Saturday. Wednesday and Sunday are just for cardio. Take flexing picture in the locker room and post on Insta because you just crushed your workout and DAMN you look good. 3:30PM – Meal 3: BEST MEAL OF THE DAY! 3 oz chicken, 3 oz sweet potato, broccoli. The last bite is so sad. Start thinking about meal 4 immediately upon completion of meal 3. But wait, what if it's a weekend or a school break and you're with your family and they want to go out to lunch at some place where you can't get plain chicken with veggies? Freak out immediately, get mad at your family and try to explain to them how important it is that you NEED to stick exactly to your meal plan. And worse... what if these lunch plans cut into your gym time? Why doesn't your family just understand you're trying to hit your goals??? 4pm – Third class of the day. Pull out your laptop and start looking at menus for your cheat meal on Saturday night. 6pm on Saturday - Still haven't heard back from coach? Start texting him because you have no idea if your meal plan will change tomorrow and you need to know right now. If he doesn't get back to you by the morning, consider it an extra cheat day. 7pm – Chapter, rehearsal, or some other activity you have that night. Whenever snacks or sweets are offered to you, as they are when you have a bunch of college girls together, pass them onto the next person because it’s not a cheat night (unless of course, you just went ham in the dining hall. Then it’s OK to have the snack). 7pm on Saturday - This is it! The moment you've been looking forward to all week. All of your dedication becomes worth it when you get to have your cheat night. Your friends know this is your special night and are excited to see where you've decided to go out to eat. You start your night with a meal that you picked out earlier in the week. Naturally, you eat the entire meal because it's just SO good and you can't put your fork down even when you're stuffed. After dinner is of course, dessert. Sometimes even a full piece of Cheesecake Factory's red velvet cheesecake all to yourself. Saturday night is also the only night you go out, since you obviously can't drink on a regular night of the week. Not that you want to go out that much, but still. You make sure to eat whatever snacks are available at the party you're at. Sometimes that's 8 Reeses peanut butter cups. But that's ok, this is your cheat meal night! Any and everything is fair game until you go to sleep. Even if it's 5am and you leave a friend's apartment just to go home and eat the cupcake you bought yourself special for this night. This is your cheat...enjoy it! You'll wake up tomorrow and start fresh all over again. You know that the scale will be 3 or 4 pounds higher than usual, but it'll be back to your regular weight by Monday. Sometimes Most of the time, you eat so much that you have to force yourself to throw up. This was never the intention - you're not bulimic or anything - but you just feel so stuffed that you have to do it to make yourself better. You text your friend "it's not a cheat meal if I don't throw up right?!" 9PM – Head home and enjoy meal 5: generally some sort of protein shake, protein ice cream if you’re feeling ballsy, or greek yogurt with peanut butter. Mmmm dessert time! 9:30 – Start to get ready for the day ahead. Cook tomorrow’s breakfast, pack your lunchbox, finish up any homework, hang with your roommates, watch TV (preferably Diners, Drive In’s & Dives because the food looks so good). 10:30 – Get into bed, close your eyes and be proud of all that you accomplished today (unless you went rogue at the dhall). You are one step closer to your goal. You feel great. You are killing it. You put your hands to your stomach…do I have abs yet? Fitness should add value to your life, not consume it. If you or someone you know struggles with obsessive behaviors towards fitness, know that there is help out there. The National Eating Disorders Association is a wonderful resource or feel free to reach out to me.